Cornelius Francis Maher grew up in The Battery, a closely knit community hugging the east end of St. John’s harbour and lived in the torn-down blue house that was painted green. Armed with a harmonica, he busked as a youngster from a dory to American servicemen during the summers of WWII. He acquired a four-stop single row accordion during his late teens and was taught many tunes by Frank Stamp who studied the playing of John Kimmel. The McNulty Family, Flanagan Brothers and his mother, Bride, were other early influences. In 1958 he became the manager and bartender of the Harbour Inn, a lively downtown watering hole, and ran it for 27 years. Most of the clientele were longshoremen and tradesmen but musicians were always welcome. Frank had his box handy behind the bar and was forever bringing it out for a tune and countless sessions. Frank dispensed beer and played music with the great Newfoundland musicians of the time including Emile Benoit, Rufus Guinchard, John White, Andy Oliver, Billy Boyles, Art Stoyles and international stars like Dolores Keane and Jackie Daly. 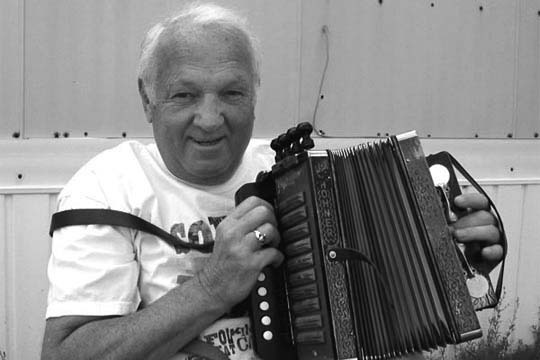 He was part of several groups including the Quidi Vidi Minstrels and the Newfoundland Kitchen Band and was a tremendous source of music for the new generation of Newfoundland groups such as Figgy Duff, Red Island, Tickle Harbour, and Christina Smith and Jean Hewson and is an inspiration to today’s fine accordion players such as Graham Wells and Dave Penny. The Harbour Inn burned down in 1986 but by then Frank had been playing with Figgy Duff for three years. Figgy Duff broke up in 1993 and Frank then played with the Plankerdown Band and the Planks for an additional year. For the past several years Frank has played on Tuesdays at the Auntie Crae Food Shop and regularly at benefits and at Folk Night at the Ship Inn with the Auntie Crae Band, and occasionally appears with Mahers Bahers at mainland festivals. He is in constant demand as a studio musician and has been recorded on over 35 albums. In recognition of his incredible musicianship, humour, wit and significant contributions to the development and preservation of Newfoundland traditional music, the St. John’s Folk Arts Council is delighted to present this year’s Lifetime Achievement Award to Frank Maher.